Hot on the heels of the release of Theme Park: Tickets of Fortune, NetEnt has done it again with another beautifully executed cartoon themed pokies game. When Pigs Fly follows a bunch of goofy pigs in space, with animation that conjures up nostalgia from the wildly popular Jetson’s cartoons of the 80’s, mixed in with inspiration from Nickelodeon’s Ren and Stimpy. The result is a quirky, entertaining video pokies game that’s sure to be a winner with any lovers of cartoons, with some fresh bonus features to keep things interesting while boosting your winning potential. 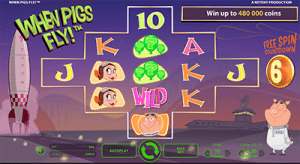 When Pigs Fly is a five-reel game with a difference, using a unique reel design unlike any other online pokies game. On top of that, it offers a huge 3125 ways to win, making it one of the more impressive 3125 Ways games we’ve yet to come across. The reels grow further towards the 3125 ways format as winning spins are placed. To play, head to any of our NetEnt casinos recommended in the table above. Once the game loads, you just need to set your desired wager using the level and coin value buttons at the bottom right hand side of the reels. You can choose a bet level between one and 10, with coins ranging from 0.01, 0.02, 0.05, 0.10 to 0.20. When Pigs Fly can be played from as little as 50 cents per spin, to a maximum bet of $100 per spin, making it suitable for all bankrolls including high rollers. Once your bet is in place, simply hit the spin button or select auto-play to have the computer play up anywhere from 10 to 1,000 spins on your behalf. You can win a jackpot of up to 480,000 coins if luck is on your side during When Pigs Fly. Wild symbol – the neon pink wild symbol appears only on reels two, three, four and five and substitutes all other symbols to form a winning combination. The wild can also appear during free spin rounds. Re-spins – to the right hand side of the reels you’ll notice the free spins countdown. After any winning spin during the main game you’ll be granted one free re-spin, where the reels change shape and the number of ways to win increases. For example, during your first re-spin you have 135 Ways to Win, but make it all the way to a fifth re-spin and you’ll have 1875 Ways to Win. As soon as you place a non-winning spin, the free spin countdown re-sets to six and you’ll need to start all over again. Free spins – make it through five winning re-spins and on the sixth you’ll trigger the free spins bonus round, during which the reels turn into a 3125 Ways to Win game. You’ll be awarded eight free spins which are paid at your current bet level, with the 3125 ways format opening the potential for some real rewards. You’ll find When Pigs Fly at a majority of leading multi-provider casinos offering NetEnt software. It’s an instant-play game which means you can play directly over your web browser with no downloads required. We recommend the leading NetEnt casinos listed in our casino table above, all which accept AUD deposits using a range of trusted payment options like Visa, MasterCard, Neteller, Skrill, Paysafecard and direct bank transfers. Sign up using our links in the table to claim some fantastic new player welcome bonuses. When Pigs Fly has also been optimised for mobile using the impressive NetEnt Touch software, so you can play on the go from your iPhone, iPad, Android or Windows device. The mobile version offers the same features and maintains the same high quality as the desktop game, making it perfect for portable play. Sign up using our links above to claim some exclusive welcome packages like matched deposit bonuses and free spins. Once again, Net Entertainment has managed to impress us with their creative way of turning a seemingly standard game into an incredibly unique one. We’ve never seen this reel format done before, where the reels grow after each winning spin and more ways to win are introduced. Thanks to this and the free spins countdown feature, it feels like there’s a lot of action going on all the time, which makes for a really entertaining gaming experience. The nostalgic, retro inspired cartoon style tops it off perfectly, and the result is a fun, light hearted game sure to be loved by many Aussie players. Play When Pigs Fly for real money at G’day Casino where new players can claim 50 free spins and a 100% unlimited matched deposit bonus when transferring AUD to your account for the first time.